" Genesee Falls, Portage, N.Y."
This early view of the Portage Wooden Bridge may have been taken as early as 1859. It shows the Bridge from the banks of the River to the south of the Bridge. 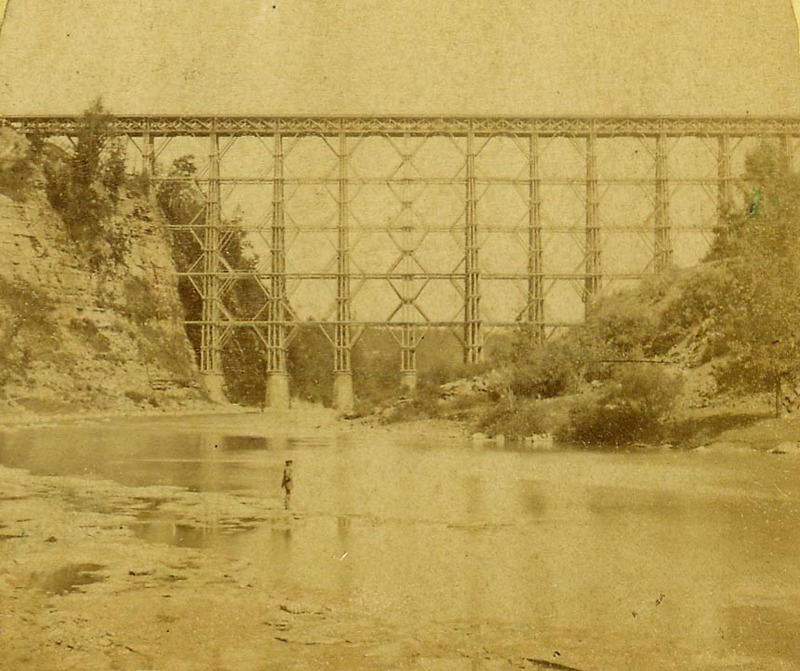 The back of the stereocard (shown below) reads "The Genesee River, at Portage, enters a grand, rocky defile, presenting for some distance a succession of magnificent and varied scenes. There are three cataracts, of 40, 80, and 60 feet descent, and the banks of the river are, in some places, from 300 to 400 feet in height. Bridge of the Buffalo and New York City Railroad. This crosses the Genesee River within one mile of the village. It is 800 feet long and 234 feet high"